Do You Believe in Magic? Bold Moves to Get Back in the Game. Home / Blog / Do You Believe in Magic? Bold Moves to Get Back in the Game. Mitch Kupchak has been the Lakers General Manager since 2000. With one of the longest GM tenures in NBA history, all of Los Angeles is surprised by his departure. Kupchak has been praised and blamed throughout the years for Laker performances. Kobe Bryant at one point called him “a mess”, but later praised Kupchak’s strategic moves saying “he goes from an F to an A-plus” (DenverPost). Unfortunately, Kupchak has failed to rebuild the Lakers organization in the recent years, and his time has run out. With nobody announced as his replacement, it is up to Magic Johnson to choose Kupchak’s replacement. Jim Buss: Will he be missed? Probably not. Even more surprising than Mitch Kupchak is Jim Buss’s departure. Who knew you could be fired from a team your late Father owned? Jim Buss took over operations from his later father, Jerry Buss in 2013. Jim has failed to live up to expectations. With a string of failed attempts to run the team, one most notably when the Lakers had the opportunity to get Phil Jackson back as head coach. The Lakers won five of their sixteen titles under Jackson’s coaching. Buss approached Jackson with the opportunity to coach again, but before any decision was made “Buss called Jackson in the middle of the night to tell him he’d hired Mike D’Antoni” (CBSSports). Laker fans were outraged and the team got swept in the first round of playoffs by the San Antonio Spurs (4-0). Even more controversial, Jackson was involved with Jim’ Buss’s sister (and owner) Jeanie Buss at the time. Jeanie said she was “stunned” by her brother’s decision. Earvin Johnson, more commonly known as Magic Johnson got his nickname from a sports reporter in High School (NBA.com). Johnson was drafted by the Lakers into the NBA in 1979. 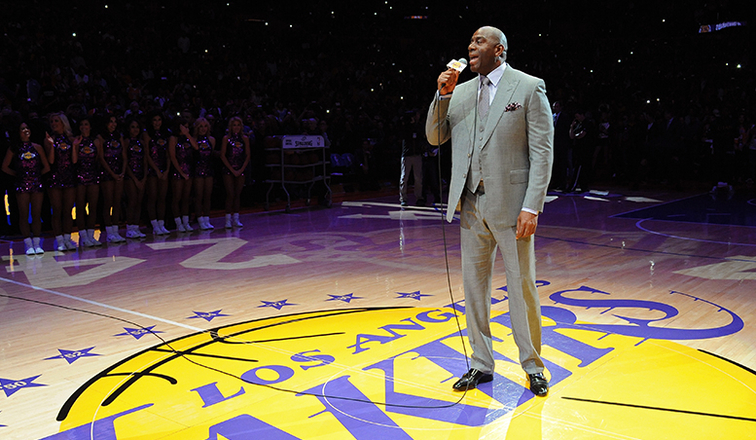 During his 13 seasons with the Lakers, Magic won five Championships, and three Most Value Player Awards. Magic announced his retirement in 1991 because of his contraction of the HIV virus. With little education at the time, people really didn’t know how to respond to it. Johnson has publicly stated his regret for retiring. Johnson’s on court success transferred into the business world. While still in the NBA, Johnson created Magic Johnson Enterprises (MJE), an investment company, and at one point “owned 105 Starbucks and a 4.5% stake in the Lakers” (Entrepreneur). Perhaps his biggest business deal to date was his purchase of the Los Angeles Dodgers. Magic, and an investment firm, purchased the Los Angeles Dodgers for $2.15 billion, which marks the biggest purchase for a sports franchise in history. Can Johnson find time to own the the Dodgers, and bring the Lakers back to champion contenders? The Dodgers don’t seem bothered with Magic’s new career opportunity. Team President, Stan Kasten, said Johnson’s role in the team’s day to day decisions “has largely been hands-off” (DodgersNation). With the Dodgers not taking up his time, the future looks good for Laker fans. The decision to bring back Magic is just what the team needs. His knowledge of the game, long history with the Lakers, and proven business track record, are the right pieces in place to turn the team around. Are you excited with this move? Let us know in the comments.